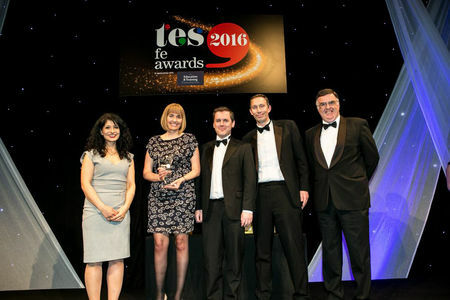 The winners of the 2016 TES FE Awards, held in association with The Education and Training Foundation, were announced on Friday 22 April 2016 at the Grosvenor House Hotel, Park Lane, London. Below are the winners in each category. Click the name of the winner to view more information. 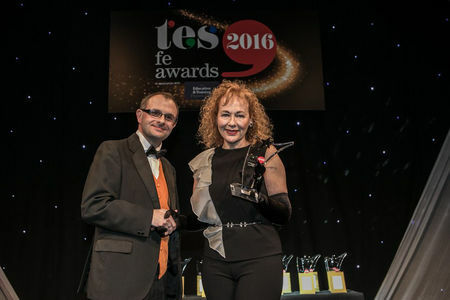 Cathy Walsh OBE, Barking & Dagenham College won the Lifetime achievement of the year award at last night’s annual TES FE Awards. Applauded for the fantastic turnaround of Barking and Dagenham College under her leadership, Cathy Walsh has been named the winner of this year’s Lifetime Achievement Award. In September 2008, Walsh took the helm of Barking and Dagenham College, situated in one of the most deprived boroughs of London. She has not only transformed the physical fabric and curriculum but also shifted the college’s entire focus towards securing the best possible learning and employment outcomes for students and the wider community. She retired as principal last year. 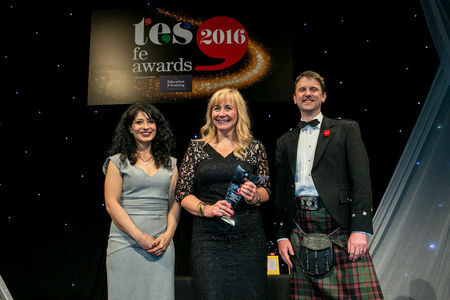 Walsh’s emphasis on enterprise and innovation, and her steadfast belief in the capacity of FE to transform learners’ life chances, have driven her to take on the role of leading and representing the sector. She is highly respected as a national champion of the skills agenda.  For the first time, the winners of the three institutional categories at this year’s TES FE Awards – Bridgwater College, Hereford Sixth Form College and ELATT Connected Learning – went head to head to be named overall provider of the year. 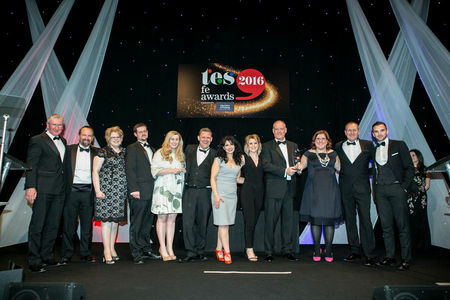 Now ELATT has become the first ever independent training provider to claim the flagship prize. In the face of continued cuts to Esol (English for speakers of other languages) funding, ELATThas provided expert courses in ICT to help learners keep up to date with the rapidly changing requirements of the job market. It has also gained plaudits for its extensive work to help unemployed and disadvantaged people, lone parents, refugees and asylum seekers in London to gain employment. ELATT’s employer engagement model is now being repeated in other curriculum areas and is an exemplar of how to work with industry for the benefit of learners and the local economy. The provider was also graded as outstanding in its most recent Ofsted inspection. The judges described ELATT as an “outstanding initiative generating great respect in East London for its work”, adding that it has achieved a “remarkable impact dealing in a difficult area and cohort”. Paul McTernan is the complex needs course manager at Barnet and Southgate College. During his 16-year career, he has developed innovative curriculum approaches and driven student-centred practice. The personalisation programme he leads has been praised by Ofsted and local authorities for enabling “momentous and visible” progress for students with profound learning difficulties. McTernan is an outstanding teacher who played a key role in engaging students and locals to design the college’s new Blue Beanz Learning Disability Centre of Excellence. The facility develops vital communication, work and independent living skills to equip students to build an economically active life for themselves in the community. He is passionate about college-wide disability integration, and is admired for always going the extra mile to ensure the best possible learning outcomes. His outstanding use of digital technology led to the introduction of “touch floor” technologies for wheelchair users, and he plays an active role in advising special schools and local authorities on best practice. ELATT Connected Learning is a not-for-profit training provider for disadvantaged learners in East London. 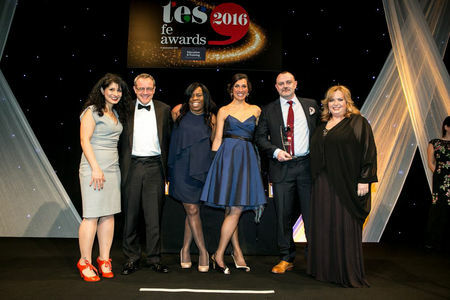 The judges said it had “pioneered a new approach to employer engagement” through its ground breaking partnership strategy. Last year, as part of the UCL Institute of Education’s Teach Too initiative, ELATT piloted an innovative model of employer engagement to increase collaboration with industry. The model explored how long-term, sustainable links with employers, alongside training that mirrored employment environments, could enhance opportunities for learners to enter work. The success of the model speaks for itself: one third of learners progressed to paid work, while others who successfully completed the placement were put on a freelance register. 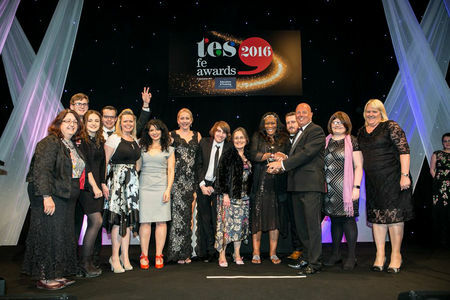 The judging panel said that, through this strategy, ELATT had demonstrated a “fantastic commitment to supporting learners”. The model is now being repeated in other curriculum areas, and the judges described it as an exemplar of how to work with industry for the benefit of learners and the local economy. Last year, ELATT was showcased in an Ofsted good practice report, and it was also featured as a case study in the inspectorate’s annual report for 2014-15. Through its digital futures strategy, which began in September 2015, Highbury College has made online learning a mandatory component in all its courses. Other initiatives include a digital learning hub (designed by one of Highbury’s students), a digital maths academy, and online literacy and safeguarding training for staff and students. To prepare for implementing online learning, lecturers submitted digital action plans and were given time to develop their course content with the help of a central support team. Meanwhile, the innovative digital maths academy takes a fully online learning approach to maths from entry level to level 2. Maths lecturers have designed the course by topic area so that students – and staff – can complete it at their own pace. They are rewarded with digital badges when they complete units. In the face of an “unprecedented” student recruitment challenge, two years ago City and Islington College’s marketing team set out to turn around poor attendance and boost learner uptake. A wide range of courses had suffered from reduced demand over a period of three years. But a campaign was launched to raise awareness of the 24+ advanced learning loan, and to increase visitors to the college website, registration on courses and email engagement. During the campaign, visitors to the college’s dedicated 24+ advanced learning loans web page increased by 84.5 per cent. Thanks to personalised content, click-through rates from enrolment emails rose by more than 400 per cent compared with two years earlier. And in the first week of enrolment, the number of adults registering on courses was 53 per cent higher than in 2014. The judges said the campaign “used intelligent measurement to clearly demonstrate a direct link between marketing activity and successful student recruitment”. They were also impressed by the use of evidence, the execution of the campaign, the effort put into evaluation and the demonstrable return on investment. In 2014-15, Forth Valley College set up a creative learning leadership group, chaired by the principal, and sought volunteers from across the college to identify opportunities for creative learning. Thirty staff came together for a day exploring the concept of creativity. At the end of this, cross-departmental partnerships were formed with a wide array of ideas to take forward. A range of projects has since been developed: science students have worked with early years pupils from the local area to develop experiments introducing scientific concepts; construction students have teamed up with make-up artistry students to learn about the injuries that can be sustained from workshop machinery; and literacy-learning campfires have been held in the woods. This year, the number of staff volunteers increased to 60. East Kent College is based in an area of high deprivation where the level of youth unemployment is almost double the national average. The college’s approach to tackling these social issues by embedding community action within study programmes has had a remarkable impact. Since gaining Youth Social Action funding, the college’s community projects initiative has grown in momentum. Staff work to raise awareness of social action among students, with the aim of developing their life skills and employability. Students also learn about teamwork, fundraising, risk assessment and community liaison. Successful projects have included catering students working with the Royal Voluntary Service to raise funds for an afternoon tea and bingo session for elderly people, and IT and supported learning students leading sessions for the general public on using tablets, email and the internet. Hackney Community College was highly commended in this category. 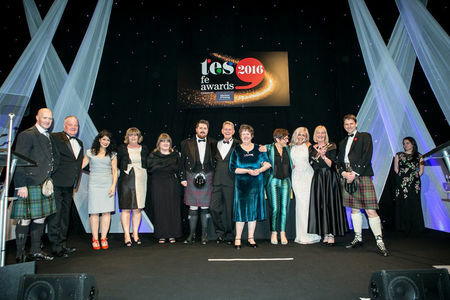 The judges felt that Gateshead College principal Judith Doyle was a “truly worthy” winner of this award. Since Doyle was appointed principal and chief executive in 2013, Gateshead has moved from an Ofsted grade 3 to grade 1. The breadth of personal testimonials impressed the judges, confirming the high regard in which Doyle is held both within the college and throughout the region. 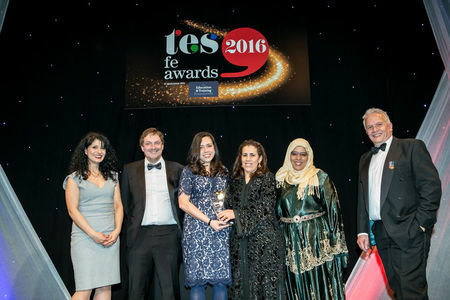 She is described as a dynamic and inspirational leader who is energetic and passionate, engaged with her staff, and wholly committed to helping her students progress into employment or further study. This is reflected in excellent outcomes: Gateshead College is third in the country for overall success rates, with achievements for apprentices 10 per cent above national benchmarks. The college has also reported strong value-added performance for its vocational learners. Some 91 per cent of learners progress into employment, apprenticeships or higher training. “To win the accolade of leader of the year from such a formidable shortlist requires a standout performance,” the judges said. “Taking a college from requiring improvement to outstanding is a good start, but to achieve that while raising the college’s profile with the business community and the local authority and ensuring financial resilience is exceptional. The judges unanimously agreed that Hackney Community College was the outstanding entry in this category. In partnership with the mental health team at its local NHS trust, the college has developed a support structure that enables learners with severe and enduring mental health issues to overcome barriers and exceed their own expectations. Almost one in four Hackney residents has been diagnosed with a mental health condition. To support this under-represented group, the college decided to set up a mental health education and employment service. Last year, the service helped a record 480 learners into education. The success rate for students with mental health issues at the college has risen to 88.3 per cent, above the national average. The partnership remains unique, and the judging panel felt that the range of support mechanisms provided could make an impact across the sector. 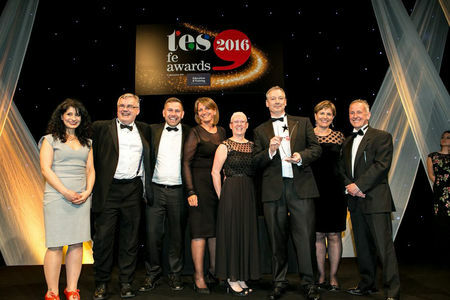 This award, now in its second year, celebrates exceptional performance by an independent training provider. The shortlisted applicants vary hugely in size and come from a number of different sectors. But ELATT Connected Learning eventually emerged as the judges’ unanimous choice because of its hard work in securing web development roles for learners. For 30 years, ELATT has helped disadvantaged learners to bridge the gap to employment in a deprived area of London. Its learners include first-generation immigrants – a group that often struggles to access work – and a very high proportion progress into employment or higher education. Through its employer engagement pilot, ELATT ensured that industry professionals worked alongside teaching staff to design the curriculum content. As a result, one third of learners found paid work; the rest were equipped with the skills to go freelance and apply for jobs alongside university graduates. 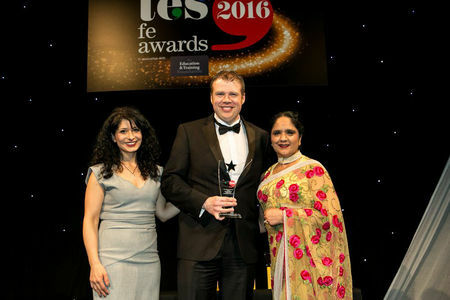 The judges said ELATT had demonstrated exceptional performance in terms of high-quality teaching, learner achievement and meeting business goals during the past academic year. 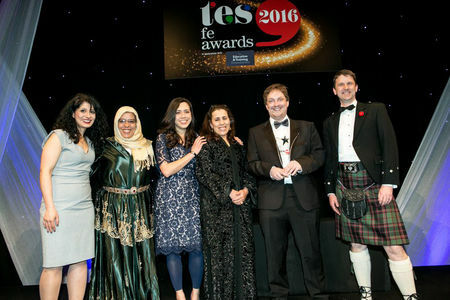 They added that the training provider was “a great example of what the FE sector is about” and the “best embodied example of diversity”. A number of highly successful colleges entered in this category, but the judges felt Bridgwater’s submission stood out from the rest. The college has sustained its outstanding performance over many years, and has built exceptional partnerships with employers and the local community. Despite a challenging funding climate, a falling number of 16- to 18-year-olds in the local area and increasing competition from sixth-form colleges and academies, Bridgwater has maintained excellent levels of student recruitment and retention. The college boasts a 100 per cent increase in the number of apprenticeships created over the past three years. And last year Bridgwater secured its largest training contract to date: a deal with the Ministry of Defence. The college is also at the forefront of responding to industry workforce needs, and has engaged in the development and delivery of Trailblazer standards for apprenticeships. Bridgwater’s achievements hinge on the leadership team’s commitment to providing the best possible learning opportunities for students and staff, and a willingness to share best practice. This is reflected in the college’s success rates – this year it was in the top 10 per cent of colleges nationally. This new award aims to celebrate providers whose approach to delivering apprenticeships stands out from the sector. 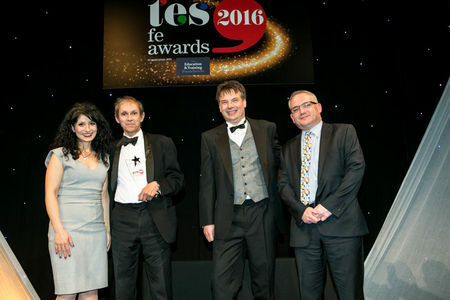 Exeter College has been named the winner in an exceptional field because of its innovative five-year apprenticeship strategy, which the judges said demonstrated “excellent results in improving recruitment and performance”. Exeter’s apprenticeship success rates are at an all-time high, 17 per cent above the national average. The college’s engagement and recruitment of apprentices has never been better. And with more than 820 local businesses supporting its apprentices, the programme has gone from strength to strength. Last year, Exeter College was highlighted by Ofsted as delivering outstanding apprenticeship provision. Outreach has also played a major role in its success: from offering apprenticeship tutorials and workshops to 80 local schools to running a regional apprenticeship exposition with employers. In its first year, the event showcased 55 employers, which offered more than 400 apprenticeships to 800 young attendees. The college supports one apprentice to act as an ambassador, promoting its programmes directly to young people. It also employs two dedicated support specialists to engage with learners who are at risk of not completing their course. 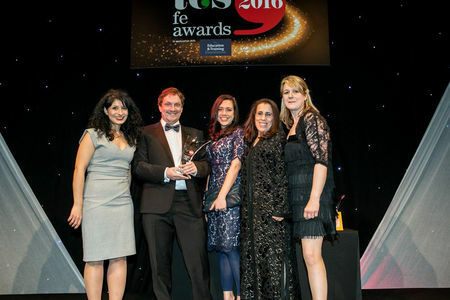 Hereford Sixth Form College was chosen as the inaugural winner of this new award, in recognition of its innovative provision and impressive student outcomes. The college is situated in one of England’s most deprived counties. Its intake reflects this: more than 10 per cent of students have a learning difficulty or disability, and nearly 10 per cent speak English as an additional language. Despite this, the college’s Alps score for the past three years puts it in the top 5 per cent of all schools and colleges in the system. The proportion of A*-B grades per A-level entry is 60 per cent – the best for non-selective sixth-form colleges nationally. Taken together with the college’s focus on supporting and stretching all students, the judges agreed that this made Hereford an all-round outstanding place to study. 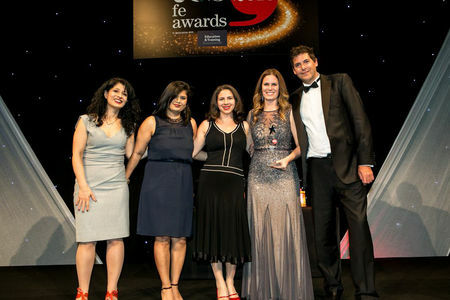 The judges said Hereford was “a worthy winner in what was a very strong field”, highlighting the college’s diverse enrichment programme and wide range of expert online lectures.